How well we understand the worth and meaning of this old building–its meaning to the man who was once to build it. Everything used to build it would be his–his timbers, his beams and boards, his labor and skill (rough though it was) to hew and fashion and make a building that would stand forever on his land for his children and their generations after them. This would not be so–not for new generations–but there are still those who love an old building and seek it out. It is too old and strong to die. The Farm is dedicated to the preservation of natural America and our rural heritage. 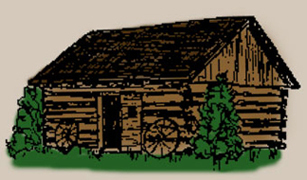 Five log buildings have been moved to The Farm in the past two decades. We hope you find our many displays in the buildings interesting and helpful in understanding the history of our country. The Sugarshack is an example of the thousands of sugarhouses (used to produce maple syrup and sugar) that were once common in Wisconsin and Canada. In 1981-82, this building was contructed below the limestone ridge to facillitate gravity when unloading the sap from the sap collection tank and with a south exposure the shack is shielded by sugar maples to aid in working comfort on cold early spring days. 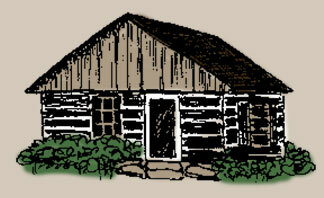 The Woodshed is the funny little crooked log building between the nature cabin and the granary. 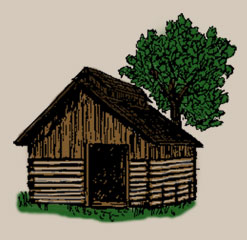 A typical farm woodshed, it was moved to The Farm in 1971. It houses the tools, wood, peat, snowshoes, etc. of a well stocked woodshed. Although it is best known for the practical child psychology that was applied within its walls, it was truly a utility and all-purpose facility for many farmers. Built in 1876 by John Simon, this building was originally a dwelling. As the farmstead developed, a larger house was built and this became a combination woodshed and granary. The Bassford House was orginally built in 1856 by pioneer George Bassford. It was the first building in what is now known as the Town of Sevastopol in Door County. 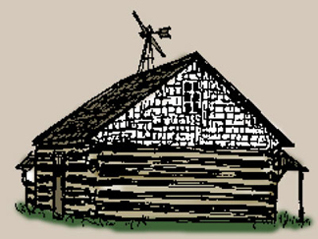 The Bassford House was moved to The Farm in 1966 and was the first cabin to be reconstructed at The Farm. 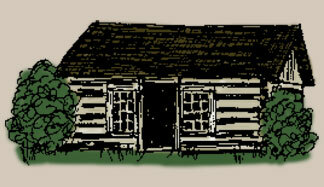 The Nature Cabin, a hewn white pine log cabin, was moved to The Farm in 1970. It was originally built by Carl Arlum in 1854 and was used to house and board some of the workers who built the only canal in Wisconsin, the Sturgeon Bay Ship Canal, during the years 1872-1881. Inside this beautiful old building you will find chicks are hatching in an observation incubator and you will see many displays that show and tell the wonders of Door County’s natural world. Making use of the large white cedars that were killed by the Tornado fire that swept through Southern Door County in 1871, John Jadin, a Belgian immigrant, constructed this building in the Town on Union, Door County, in 1874. He built it as a cattle barn with a lean-to for human habitation. It was later converted to a horse barn and granary. Due to the high cost of glass, it has only one small window in the door on the ground floor. The use of stovewood construction is demonstrated in a section of the north wall. Also displayed in the Granary are several seed varieties, barbed wire collection, a still, wine press and antique farm machinery including a scale that you may want to weigh yourself on. Can you find all the historical fences and stiles used on The Farm? YOU NEED NOT BE A STUDENT of nature to find pleasure in a leisurely walk through The Farm woods. “Let’s go to the woods.” These words brought excitement to every member of the farm family. The woods provided fuel, maple syrup, building material, nuts, berries, game, and many hours of pleasure. To farm folk, the woods was a park, movie theater, concert hall, museum and zoo. We invite you to enjoy one of the greatest pleasures of the past–and present–a walk in the woods. Please take time to stop, look, listen, smell and daydream. Stop a moment on the bridge that crossses the woods pond. Can you see the fish? They often hide under the bridge. Because knowledge increases pleasure, signs are provided, some with brief descriptive statements, identifying the wonders of the woods. THE PRAIRIE IS A precious part of our American heritage that has almost disappeared. Scientists claim that the prairie is the most complex, yet balanced ecosystem on earth. Because of renewed interest in the prairies of Wisconsin, a prairie was planted on TheFarm. The south half of the meadow near the farm pond has been established as a tall grass mesic prairie. Annual or biennial burning is necessary to remove dead vegetation and prevent the “take over” of woody plants. Take the short prairie trail and view what the early settlers saw as they came into the prairie areas. You may be surprised at the beauty of the prairie flowers and grasses. VEGETABLES, FLOWERS, HERBS, and farm crops are growing in the bountiful gardens at TheFarm. 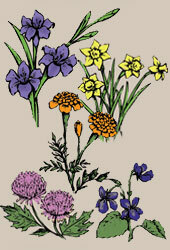 A very important part of the country’s past, gardening has become one of America’s favorite recreational activities. The value of herbs in cooking is again being recognized, resulting in an “herban” renewal. In late summer, the corn walk is an interesting sojourn through The Farm’s exceptionally tall corn. Our tall corn is attributed to T.L.C. and the bery best organic fertilizers. The Farm also has sunflower and poppy gardens. Many varieties, some common and some rather unusual can be seen in these plots. We hope you enjoy The Farm’s beautiful gardens as much as we do and please pick a four-leafed clover from our profusion of good luck plants.